The FASTCAM SA6 has been developed to permit high definition recording and detailed high speed analysis of large spatial areas in applications such as automotive safety testing, fluid dynamics and solid mechanics. The system provides 1920×1440 pixel image resolution at all frame rates up to 1,125fps, 1920×1080 full HD resolution at frame rates up to 1,500fps and recording rates up to 75,000fps at reduced resolution. 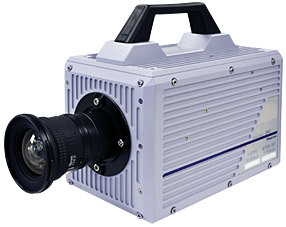 The system utilizes a high performance CMOS image sensor to provide excellent light sensitivity allowing high speed recordings to be made with the minimum of additional lighting. The utilization of 12bit dynamic range output yields exceptional image quality and superior color fidelity. Photron’s experience in the field of high quality broadcast imaging provides a stable camera operation and superior imaging performance. The camera may be controlled via the optional remote local keypad or over a Gigabit Ethernet network, and is fully compatible with the Photron J-BOX for multiple camera installations. Integrated capping shutter to facilitate automated calibration and automated lens control options further extend the ease of system operation. The system is supplied with intuitive Photron FASTCAM Viewer (PFV) software and Photron Device Control SDK(software development kit) allowing integration with user specific software.